This article is about the astronomical structure. For our galaxy, see Milky Way. For other uses, see Galaxy (disambiguation). NGC 4414, a typical spiral galaxy in the constellation Coma Berenices, is about 55,000 light-years in diameter and approximately 60 million light-years from Earth. A galaxy is a gravitationally bound system of stars, stellar remnants, interstellar gas, dust, and dark matter. 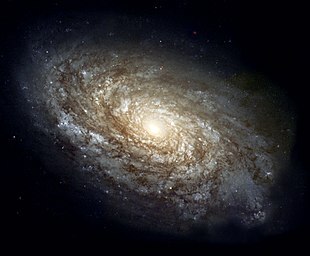 The word galaxy is derived from the Greek galaxias (γαλαξίας), literally "milky", a reference to the Milky Way. Galaxies range in size from dwarfs with just a few hundred million (108) stars to giants with one hundred trillion (1014) stars, each orbiting its galaxy's center of mass. Galaxies are categorized according to their visual morphology as elliptical, spiral, or irregular. Many galaxies are thought to have supermassive black holes at their centers. The Milky Way's central black hole, known as Sagittarius A*, has a mass four million times greater than the Sun. As of March 2016, GN-z11 is the oldest and most distant observed galaxy with a comoving distance of 32 billion light-years from Earth, and observed as it existed just 400 million years after the Big Bang. Research released in 2016 revised the number of galaxies in the observable universe from a previous estimate of 200 billion (7011200000000000000♠2×1011) to a suggested 2 trillion (7012200000000000000♠2×1012) or more, containing more stars than all the grains of sand on planet Earth. Most of the galaxies are 1,000 to 100,000 parsecs in diameter (approximately 3000 to 300,000 light years) and separated by distances on the order of millions of parsecs (or megaparsecs). For comparison, the Milky Way has a diameter of at least 30,000 parsecs (100,000 LY) and is separated from the Andromeda Galaxy, its nearest large neighbor, by 780,000 parsecs (2.5 million LY). The space between galaxies is filled with a tenuous gas (the intergalactic medium) having an average density of less than one atom per cubic meter. The majority of galaxies are gravitationally organized into groups, clusters, and superclusters. The Milky Way is part of the Local Group, which is dominated by it and the Andromeda Galaxy and is part of the Virgo Supercluster. At the largest scale, these associations are generally arranged into sheets and filaments surrounded by immense voids. The largest structure of galaxies yet recognised is a cluster of superclusters that has been named Laniakea, which contains the Virgo supercluster. The origin of the word galaxy derives from the Greek term for the Milky Way, galaxias (γαλαξίας, "milky one"), or kyklos galaktikos ("milky circle") due to its appearance as a "milky" band of light in the sky. In Greek mythology, Zeus places his son born by a mortal woman, the infant Heracles, on Hera's breast while she is asleep so that the baby will drink her divine milk and will thus become immortal. Hera wakes up while breastfeeding and then realizes she is nursing an unknown baby: she pushes the baby away, some of her milk spills, and it produces the faint band of light known as the Milky Way. Galaxies were initially discovered telescopically and were known as spiral nebulae. Most 18th to 19th Century astronomers considered them as either unresolved star clusters or anagalactic nebulae, and were just thought as a part of the Milky Way, but their true composition and natures remained a mystery. Observations using larger telescopes of a few nearby bright galaxies, like the Andromeda Galaxy, began resolving them into huge conglomerations of stars, but based simply on the apparent faintness and sheer population of stars, the true distances of these objects placed them well beyond the Milky Way. For this reason they were popularly called island universes, but this term quickly fell into disuse, as the word universe implied the entirety of existence. Instead, they became known simply as galaxies. Galaxy cluster SDSS J1152+3313. SDSS stands for Sloan Digital Sky Survey, J for Julian epoch, and 1152+3313 for the declination and right ascension respectively. Tens of thousands of galaxies have been catalogued, but only a few have well-established names, such as the Andromeda Galaxy, the Magellanic Clouds, the Whirlpool Galaxy, and the Sombrero Galaxy. Astronomers work with numbers from certain catalogues, such as the Messier catalogue, the NGC (New General Catalogue), the IC (Index Catalogue), the CGCG (Catalogue of Galaxies and of Clusters of Galaxies), the MCG (Morphological Catalogue of Galaxies) and UGC (Uppsala General Catalogue of Galaxies). All of the well-known galaxies appear in one or more of these catalogues but each time under a different number. For example, Messier 109 is a spiral galaxy having the number 109 in the catalogue of Messier, and also having the designations NGC 3992, UGC 6937, CGCG 269-023, MCG +09-20-044, and PGC 37617. The realization that we live in a galaxy which is one among many galaxies, parallels major discoveries that were made about the Milky Way and other nebulae. The Greek philosopher Democritus (450–370 BCE) proposed that the bright band on the night sky known as the Milky Way might consist of distant stars.Aristotle (384–322 BCE), however, believed the Milky Way to be caused by "the ignition of the fiery exhalation of some stars that were large, numerous and close together" and that the "ignition takes place in the upper part of the atmosphere, in the region of the World that is continuous with the heavenly motions." The Neoplatonist philosopher Olympiodorus the Younger (c. 495–570 CE) was critical of this view, arguing that if the Milky Way is sublunary (situated between Earth and the Moon) it should appear different at different times and places on Earth, and that it should have parallax, which it does not. In his view, the Milky Way is celestial. According to Mohani Mohamed, the Arabian astronomer Alhazen (965–1037) made the first attempt at observing and measuring the Milky Way's parallax, and he thus "determined that because the Milky Way had no parallax, it must be remote from the Earth, not belonging to the atmosphere." The Persian astronomer al-Bīrūnī (973–1048) proposed the Milky Way galaxy to be "a collection of countless fragments of the nature of nebulous stars." The Andalusian astronomer Ibn Bâjjah ("Avempace", d. 1138) proposed that the Milky Way is made up of many stars that almost touch one another and appear to be a continuous image due to the effect of refraction from sublunary material, citing his observation of the conjunction of Jupiter and Mars as evidence of this occurring when two objects are near. In the 14th century, the Syrian-born Ibn Qayyim proposed the Milky Way galaxy to be "a myriad of tiny stars packed together in the sphere of the fixed stars." The shape of the Milky Way as estimated from star counts by William Herschel in 1785; the Solar System was assumed to be near the center. Actual proof of the Milky Way consisting of many stars came in 1610 when the Italian astronomer Galileo Galilei used a telescope to study the Milky Way and discovered that it is composed of a huge number of faint stars. In 1750 the English astronomer Thomas Wright, in his An original theory or new hypothesis of the Universe, speculated (correctly) that the galaxy might be a rotating body of a huge number of stars held together by gravitational forces, akin to the Solar System but on a much larger scale. The resulting disk of stars can be seen as a band on the sky from our perspective inside the disk. In a treatise in 1755, Immanuel Kant elaborated on Wright's idea about the structure of the Milky Way. The first project to describe the shape of the Milky Way and the position of the Sun was undertaken by William Herschel in 1785 by counting the number of stars in different regions of the sky. He produced a diagram of the shape of the galaxy with the Solar System close to the center. Using a refined approach, Kapteyn in 1920 arrived at the picture of a small (diameter about 15 kiloparsecs) ellipsoid galaxy with the Sun close to the center. A different method by Harlow Shapley based on the cataloguing of globular clusters led to a radically different picture: a flat disk with diameter approximately 70 kiloparsecs and the Sun far from the center. Both analyses failed to take into account the absorption of light by interstellar dust present in the galactic plane, but after Robert Julius Trumpler quantified this effect in 1930 by studying open clusters, the present picture of our host galaxy, the Milky Way, emerged. A fish-eye mosaic of the Milky Way arching at a high inclination across the night sky, shot from a dark-sky location in Chile. The Magellanic Clouds, satellite galaxies of the Milky Way, appear near the left edge. A few galaxies outside the Milky Way are visible on a dark night to the unaided eye, including the Andromeda Galaxy, Large Magellanic Cloud, the Small Magellanic Cloud, and the Triangulum Galaxy. 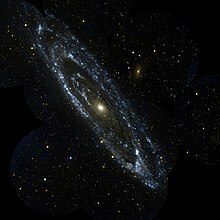 In the 10th century, the Persian astronomer Al-Sufi made the earliest recorded identification of the Andromeda Galaxy, describing it as a "small cloud". In 964, Al-Sufi probably mentioned the Large Magellanic Cloud in his Book of Fixed Stars (referring to "Al Bakr of the southern Arabs", since at a declination of about 70° south it was not visible where he lived); it was not well known to Europeans until Magellan's voyage in the 16th century. The Andromeda Galaxy was later independently noted by Simon Marius in 1612. In 1734, philosopher Emanuel Swedenborg in his Principia speculated that there may be galaxies outside our own that are formed into galactic clusters that are miniscule parts of the universe which extends far beyond what we can see. These views "are remarkably close to the present-day views of the cosmos." In 1750, Thomas Wright speculated (correctly) that the Milky Way is a flattened disk of stars, and that some of the nebulae visible in the night sky might be separate Milky Ways. In 1755, Immanuel Kant used the term "island Universe" to describe these distant nebulae. Toward the end of the 18th century, Charles Messier compiled a catalog containing the 109 brightest celestial objects having nebulous appearance. Subsequently, William Herschel assembled a catalog of 5,000 nebulae. In 1845, Lord Rosse constructed a new telescope and was able to distinguish between elliptical and spiral nebulae. He also managed to make out individual point sources in some of these nebulae, lending credence to Kant's earlier conjecture. In 1912, Vesto Slipher made spectrographic studies of the brightest spiral nebulae to determine their composition. Slipher discovered that the spiral nebulae have high Doppler shifts, indicating that they are moving at a rate exceeding the velocity of the stars he had measured. He found that the majority of these nebulae are moving away from us. In 1917, Heber Curtis observed nova S Andromedae within the "Great Andromeda Nebula" (as the Andromeda Galaxy, Messier object M31, was then known). Searching the photographic record, he found 11 more novae. Curtis noticed that these novae were, on average, 10 magnitudes fainter than those that occurred within our galaxy. As a result, he was able to come up with a distance estimate of 150,000 parsecs. He became a proponent of the so-called "island universes" hypothesis, which holds that spiral nebulae are actually independent galaxies. In 1920 a debate took place between Harlow Shapley and Heber Curtis (the Great Debate), concerning the nature of the Milky Way, spiral nebulae, and the dimensions of the Universe. To support his claim that the Great Andromeda Nebula is an external galaxy, Curtis noted the appearance of dark lanes resembling the dust clouds in the Milky Way, as well as the significant Doppler shift. In 1922, the Estonian astronomer Ernst Öpik gave a distance determination that supported the theory that the Andromeda Nebula is indeed a distant extra-galactic object. Using the new 100 inch Mt. Wilson telescope, Edwin Hubble was able to resolve the outer parts of some spiral nebulae as collections of individual stars and identified some Cepheid variables, thus allowing him to estimate the distance to the nebulae: they were far too distant to be part of the Milky Way. In 1936 Hubble produced a classification of galactic morphology that is used to this day. Rotation curve of a typical spiral galaxy: predicted based on the visible matter (A) and observed (B). The distance is from the galactic core. In 1944, Hendrik van de Hulst predicted that microwave radiation with wavelength of 21 cm would be detectable from interstellar atomic hydrogen gas; and in 1951 it was observed. This radiation is not affected by dust absorption, and so its Doppler shift can be used to map the motion of the gas in our galaxy. These observations led to the hypothesis of a rotating bar structure in the center of our galaxy. With improved radio telescopes, hydrogen gas could also be traced in other galaxies. In the 1970s, Vera Rubin uncovered a discrepancy between observed galactic rotation speed and that predicted by the visible mass of stars and gas. Today, the galaxy rotation problem is thought to be explained by the presence of large quantities of unseen dark matter. Scientists used the galaxies visible in the GOODS survey to recalculate the total number of galaxies. Beginning in the 1990s, the Hubble Space Telescope yielded improved observations. Among other things, Hubble data helped establish that the missing dark matter in our galaxy cannot solely consist of inherently faint and small stars. The Hubble Deep Field, an extremely long exposure of a relatively empty part of the sky, provided evidence that there are about 125 billion (7011125000000000000♠1.25×1011) galaxies in the observable universe. Improved technology in detecting the spectra invisible to humans (radio telescopes, infrared cameras, and x-ray telescopes) allow detection of other galaxies that are not detected by Hubble. Particularly, galaxy surveys in the Zone of Avoidance (the region of the sky blocked at visible-light wavelengths by the Milky Way) have revealed a number of new galaxies. In 2016, a study published in The Astrophysical Journal and led by Christopher Conselice of the University of Nottingham using 3D modeling of images collected over 20 years by the Hubble Space Telescope concluded that there are over 2 trillion (7012200000000000000♠2×1012) galaxies in the observable universe. Galaxies come in three main types: ellipticals, spirals, and irregulars. A slightly more extensive description of galaxy types based on their appearance is given by the Hubble sequence. Since the Hubble sequence is entirely based upon visual morphological type (shape), it may miss certain important characteristics of galaxies such as star formation rate in starburst galaxies and activity in the cores of active galaxies. The Hubble classification system rates elliptical galaxies on the basis of their ellipticity, ranging from E0, being nearly spherical, up to E7, which is highly elongated. These galaxies have an ellipsoidal profile, giving them an elliptical appearance regardless of the viewing angle. Their appearance shows little structure and they typically have relatively little interstellar matter. Consequently, these galaxies also have a low portion of open clusters and a reduced rate of new star formation. Instead they are dominated by generally older, more evolved stars that are orbiting the common center of gravity in random directions. The stars contain low abundances of heavy elements because star formation ceases after the initial burst. In this sense they have some similarity to the much smaller globular clusters. The largest galaxies are giant ellipticals. Many elliptical galaxies are believed to form due to the interaction of galaxies, resulting in a collision and merger. They can grow to enormous sizes (compared to spiral galaxies, for example), and giant elliptical galaxies are often found near the core of large galaxy clusters. A shell galaxy is a type of elliptical galaxy where the stars in the galaxy's halo are arranged in concentric shells. About one-tenth of elliptical galaxies have a shell-like structure, which has never been observed in spiral galaxies. The shell-like structures are thought to develop when a larger galaxy absorbs a smaller companion galaxy. As the two galaxy centers approach, the centers start to oscillate around a center point, the oscillation creates gravitational ripples forming the shells of stars, similar to ripples spreading on water. For example, galaxy NGC 3923 has over twenty shells. 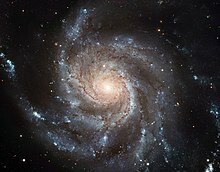 Spiral galaxies resemble spiraling pinwheels. Though the stars and other visible material contained in such a galaxy lie mostly on a plane, the majority of mass in spiral galaxies exists in a roughly spherical halo of dark matter that extends beyond the visible component, as demonstrated by the universal rotation curve concept. Spiral galaxies consist of a rotating disk of stars and interstellar medium, along with a central bulge of generally older stars. Extending outward from the bulge are relatively bright arms. In the Hubble classification scheme, spiral galaxies are listed as type S, followed by a letter (a, b, or c) that indicates the degree of tightness of the spiral arms and the size of the central bulge. An Sa galaxy has tightly wound, poorly defined arms and possesses a relatively large core region. At the other extreme, an Sc galaxy has open, well-defined arms and a small core region. A galaxy with poorly defined arms is sometimes referred to as a flocculent spiral galaxy; in contrast to the grand design spiral galaxy that has prominent and well-defined spiral arms. The speed in which a galaxy rotates is thought to correlate with the flatness of the disc as some spiral galaxies have thick bulges, while others are thin and dense. In spiral galaxies, the spiral arms do have the shape of approximate logarithmic spirals, a pattern that can be theoretically shown to result from a disturbance in a uniformly rotating mass of stars. Like the stars, the spiral arms rotate around the center, but they do so with constant angular velocity. The spiral arms are thought to be areas of high-density matter, or "density waves". As stars move through an arm, the space velocity of each stellar system is modified by the gravitational force of the higher density. (The velocity returns to normal after the stars depart on the other side of the arm.) This effect is akin to a "wave" of slowdowns moving along a highway full of moving cars. The arms are visible because the high density facilitates star formation, and therefore they harbor many bright and young stars. A majority of spiral galaxies, including our own Milky Way galaxy, have a linear, bar-shaped band of stars that extends outward to either side of the core, then merges into the spiral arm structure. 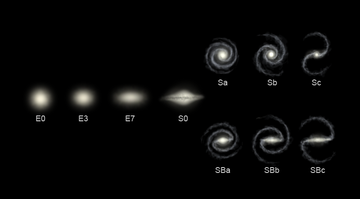 In the Hubble classification scheme, these are designated by an SB, followed by a lower-case letter (a, b or c) that indicates the form of the spiral arms (in the same manner as the categorization of normal spiral galaxies). Bars are thought to be temporary structures that can occur as a result of a density wave radiating outward from the core, or else due to a tidal interaction with another galaxy. Many barred spiral galaxies are active, possibly as a result of gas being channeled into the core along the arms. Our own galaxy, the Milky Way, is a large disk-shaped barred-spiral galaxy about 30 kiloparsecs in diameter and a kiloparsec thick. It contains about two hundred billion (2×1011) stars and has a total mass of about six hundred billion (6×1011) times the mass of the Sun. Recently, researchers described galaxies called super-luminous spirals. They are very large with an upward diameter of 437,000 light-years (compared to the Milky Way's 100,000 light-year diameter). With a mass of 340 billion solar masses, they generate a significant amount of ultraviolet and mid-infrared light. They are thought to have an increased star formation rate around 30 times faster than the Milky Way. Peculiar galaxies are galactic formations that develop unusual properties due to tidal interactions with other galaxies. A ring galaxy has a ring-like structure of stars and interstellar medium surrounding a bare core. 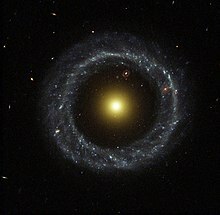 A ring galaxy is thought to occur when a smaller galaxy passes through the core of a spiral galaxy. Such an event may have affected the Andromeda Galaxy, as it displays a multi-ring-like structure when viewed in infrared radiation. Irregular galaxies are galaxies that can not be readily classified into an elliptical or spiral morphology. An Irr-I galaxy has some structure but does not align cleanly with the Hubble classification scheme. Irr-II galaxies do not possess any structure that resembles a Hubble classification, and may have been disrupted. Nearby examples of (dwarf) irregular galaxies include the Magellanic Clouds. An ultra diffuse galaxy (UDG) is an extremely-low-density galaxy. The galaxy may be the same size as the Milky Way but has a visible star count of only 1% of the Milky Way. The lack of luminosity is because there is a lack of star-forming gas in the galaxy which results in old stellar populations. Despite the prominence of large elliptical and spiral galaxies, most galaxies in the Universe are dwarf galaxies. These galaxies are relatively small when compared with other galactic formations, being about one hundredth the size of the Milky Way, containing only a few billion stars. Ultra-compact dwarf galaxies have recently been discovered that are only 100 parsecs across. Many dwarf galaxies may orbit a single larger galaxy; the Milky Way has at least a dozen such satellites, with an estimated 300–500 yet to be discovered. Dwarf galaxies may also be classified as elliptical, spiral, or irregular. Since small dwarf ellipticals bear little resemblance to large ellipticals, they are often called dwarf spheroidal galaxies instead. A study of 27 Milky Way neighbors found that in all dwarf galaxies, the central mass is approximately 10 million solar masses, regardless of whether the galaxy has thousands or millions of stars. This has led to the suggestion that galaxies are largely formed by dark matter, and that the minimum size may indicate a form of warm dark matter incapable of gravitational coalescence on a smaller scale. 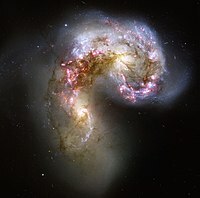 The Antennae Galaxies are undergoing a collision that will result in their eventual merger. Interactions between galaxies are relatively frequent, and they can play an important role in galactic evolution. Near misses between galaxies result in warping distortions due to tidal interactions, and may cause some exchange of gas and dust. Collisions occur when two galaxies pass directly through each other and have sufficient relative momentum not to merge. The stars of interacting galaxies will usually not collide, but the gas and dust within the two forms will interact, sometimes triggering star formation. A collision can severely distort the shape of the galaxies, forming bars, rings or tail-like structures. At the extreme of interactions are galactic mergers. In this case the relative momentum of the two galaxies is insufficient to allow the galaxies to pass through each other. Instead, they gradually merge to form a single, larger galaxy. Mergers can result in significant changes to morphology, as compared to the original galaxies. If one of the merging galaxies is much more massive than the other merging galaxy then the result is known as cannibalism. The more massive larger galaxy will remain relatively undisturbed by the merger, while the smaller galaxy is torn apart. The Milky Way galaxy is currently in the process of cannibalizing the Sagittarius Dwarf Elliptical Galaxy and the Canis Major Dwarf Galaxy. Stars are created within galaxies from a reserve of cold gas that forms into giant molecular clouds. Some galaxies have been observed to form stars at an exceptional rate, which is known as a starburst. If they continue to do so, then they would consume their reserve of gas in a time span less than the lifespan of the galaxy. Hence starburst activity usually lasts for only about ten million years, a relatively brief period in the history of a galaxy. Starburst galaxies were more common during the early history of the Universe, and, at present, still contribute an estimated 15% to the total star production rate. Starburst galaxies are characterized by dusty concentrations of gas and the appearance of newly formed stars, including massive stars that ionize the surrounding clouds to create H II regions. These massive stars produce supernova explosions, resulting in expanding remnants that interact powerfully with the surrounding gas. These outbursts trigger a chain reaction of star building that spreads throughout the gaseous region. Only when the available gas is nearly consumed or dispersed does the starburst activity end. Starbursts are often associated with merging or interacting galaxies. 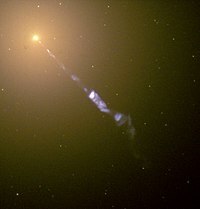 The prototype example of such a starburst-forming interaction is M82, which experienced a close encounter with the larger M81. Irregular galaxies often exhibit spaced knots of starburst activity. A jet of particles is being emitted from the core of the elliptical radio galaxy M87. A portion of the observable galaxies are classified as active galaxies if the galaxy contains an active galactic nucleus (AGN). A significant portion of the total energy output from the galaxy is emitted by the active galactic nucleus, instead of the stars, dust and interstellar medium of the galaxy. The standard model for an active galactic nucleus is based upon an accretion disc that forms around a supermassive black hole (SMBH) at the core region of the galaxy. The radiation from an active galactic nucleus results from the gravitational energy of matter as it falls toward the black hole from the disc. In about 10% of these galaxies, a diametrically opposed pair of energetic jets ejects particles from the galaxy core at velocities close to the speed of light. The mechanism for producing these jets is not well understood. Seyfert galaxies or quasars, are classified depending on the luminosity, are active galaxies that emit high-energy radiation in the form of x-rays. Blazars are believed to be an active galaxy with a relativistic jet that is pointed in the direction of Earth. A radio galaxy emits radio frequencies from relativistic jets. A unified model of these types of active galaxies explains their differences based on the viewing angle of the observer. Possibly related to active galactic nuclei (as well as starburst regions) are low-ionization nuclear emission-line regions (LINERs). The emission from LINER-type galaxies is dominated by weakly ionized elements. The excitation sources for the weakly ionized lines include post-AGB stars, AGN, and shocks. Approximately one-third of nearby galaxies are classified as containing LINER nuclei. Seyfert galaxies are one of the two largest groups of active galaxies, along with quasars. They have quasar-like nuclei (very luminous, distant and bright sources of electromagnetic radiation) with very high surface brightnesses but unlike quasars, their host galaxies are clearly detectable. Seyfert galaxies account for about 10% of all galaxies. Seen in visible light, most Seyfert galaxies look like normal spiral galaxies, but when studied under other wavelengths, the luminosity of their cores is equivalent to the luminosity of whole galaxies the size of the Milky Way. Quasars (/ˈkweɪzɑr/) or quasi-stellar radio sources are the most energetic and distant members of active galactic nuclei. Quasars are extremely luminous and were first identified as being high redshift sources of electromagnetic energy, including radio waves and visible light, that appeared to be similar to stars, rather than extended sources similar to galaxies. Their luminosity can be 100 times greater than that of the Milky Way. Luminous infrared galaxies or LIRGs are galaxies with luminosities, the measurement of brightness, above 1011 L☉. LIRGs are more abundant than starburst galaxies, Seyfert galaxies and quasi-stellar objects at comparable total luminosity. Infrared galaxies emit more energy in the infrared than at all other wavelengths combined. A LIRG's luminosity is 100 billion times that of our Sun. Galaxies have magnetic fields of their own. They are strong enough to be dynamically important: they drive mass inflow into the centers of galaxies, they modify the formation of spiral arms and they can affect the rotation of gas in the outer regions of galaxies. Magnetic fields provide the transport of angular momentum required for the collapse of gas clouds and hence the formation of new stars. The typical average equipartition strength for spiral galaxies is about 10 μG (microGauss) or 1 nT (nanoTesla). For comparison, the Earth's magnetic field has an average strength of about 0.3 G (Gauss or 30 μT (microTesla). Radio-faint galaxies like M 31 and M 33, our Milky Way's neighbors, have weaker fields (about 5 μG), while gas-rich galaxies with high star-formation rates, like M 51, M 83 and NGC 6946, have 15 μG on average. In prominent spiral arms the field strength can be up to 25 μG, in regions where cold gas and dust are also concentrated. 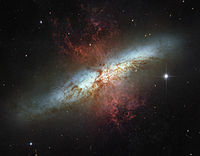 The strongest total equipartition fields (50–100 μG) were found in starburst galaxies, for example in M 82 and the Antennae, and in nuclear starburst regions, for example in the centers of NGC 1097 and of other barred galaxies. Galactic formation and evolution is an active area of research in astrophysics. Current cosmological models of the early Universe are based on the Big Bang theory. About 300,000 years after this event, atoms of hydrogen and helium began to form, in an event called recombination. Nearly all the hydrogen was neutral (non-ionized) and readily absorbed light, and no stars had yet formed. As a result, this period has been called the "dark ages". It was from density fluctuations (or anisotropic irregularities) in this primordial matter that larger structures began to appear. As a result, masses of baryonic matter started to condense within cold dark matter halos. These primordial structures would eventually become the galaxies we see today. Evidence for the early appearance of galaxies was found in 2006, when it was discovered that the galaxy IOK-1 has an unusually high redshift of 6.96, corresponding to just 750 million years after the Big Bang and making it the most distant and primordial galaxy yet seen. While some scientists have claimed other objects (such as Abell 1835 IR1916) have higher redshifts (and therefore are seen in an earlier stage of the Universe's evolution), IOK-1's age and composition have been more reliably established. In December 2012, astronomers reported that UDFj-39546284 is the most distant object known and has a redshift value of 11.9. The object, estimated to have existed around "380 million years" after the Big Bang (which was about 13.8 billion years ago), is about 13.42 billion light travel distance years away. The existence of such early protogalaxies suggests that they must have grown in the so-called "dark ages". As of May 5, 2015, the galaxy EGS-zs8-1 is the most distant and earliest galaxy measured, forming 670 million years after the Big Bang. The light from EGS-zs8-1 has taken 13 billion years to reach Earth, and is now 30 billion light-years away, because of the expansion of the universe during 13 billion years. The detailed process by which early galaxies formed is an open question in astrophysics. Theories can be divided into two categories: top-down and bottom-up. In top-down correlations (such as the Eggen–Lynden-Bell–Sandage [ELS] model), protogalaxies form in a large-scale simultaneous collapse lasting about one hundred million years. In bottom-up theories (such as the Searle-Zinn [SZ] model), small structures such as globular clusters form first, and then a number of such bodies accrete to form a larger galaxy. Once protogalaxies began to form and contract, the first halo stars (called Population III stars) appeared within them. These were composed almost entirely of hydrogen and helium, and may have been massive. If so, these huge stars would have quickly consumed their supply of fuel and became supernovae, releasing heavy elements into the interstellar medium. This first generation of stars re-ionized the surrounding neutral hydrogen, creating expanding bubbles of space through which light could readily travel. In June 2015, astronomers reported evidence for Population III stars in the Cosmos Redshift 7 galaxy at z = 6.60. Such stars are likely to have existed in the very early universe (i.e., at high redshift), and may have started the production of chemical elements heavier than hydrogen that are needed for the later formation of planets and life as we know it. Within a billion years of a galaxy's formation, key structures begin to appear. Globular clusters, the central supermassive black hole, and a galactic bulge of metal-poor Population II stars form. The creation of a supermassive black hole appears to play a key role in actively regulating the growth of galaxies by limiting the total amount of additional matter added. During this early epoch, galaxies undergo a major burst of star formation. During the following two billion years, the accumulated matter settles into a galactic disc. A galaxy will continue to absorb infalling material from high-velocity clouds and dwarf galaxies throughout its life. This matter is mostly hydrogen and helium. The cycle of stellar birth and death slowly increases the abundance of heavy elements, eventually allowing the formation of planets. 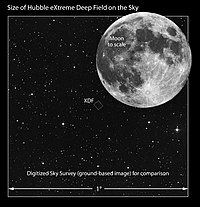 XDF view field compared to the angular size of the Moon. Several thousand galaxies, each consisting of billions of stars, are in this small view. XDF (2012) view: Each light speck is a galaxy, some of which are as old as 13.2 billion years – the observable universe is estimated to contain 200 billion to 2 trillion galaxies. XDF image shows (from left) fully mature galaxies, nearly mature galaxies (from 5 to 9 billion years ago), and protogalaxies, blazing with young stars (beyond 9 billion years). The evolution of galaxies can be significantly affected by interactions and collisions. Mergers of galaxies were common during the early epoch, and the majority of galaxies were peculiar in morphology. Given the distances between the stars, the great majority of stellar systems in colliding galaxies will be unaffected. However, gravitational stripping of the interstellar gas and dust that makes up the spiral arms produces a long train of stars known as tidal tails. Examples of these formations can be seen in NGC 4676 or the Antennae Galaxies. The Milky Way galaxy and the nearby Andromeda Galaxy are moving toward each other at about 130 km/s, and—depending upon the lateral movements—the two might collide in about five to six billion years. Although the Milky Way has never collided with a galaxy as large as Andromeda before, evidence of past collisions of the Milky Way with smaller dwarf galaxies is increasing. Such large-scale interactions are rare. As time passes, mergers of two systems of equal size become less common. Most bright galaxies have remained fundamentally unchanged for the last few billion years, and the net rate of star formation probably also peaked approximately ten billion years ago. Spiral galaxies, like the Milky Way, produce new generations of stars as long as they have dense molecular clouds of interstellar hydrogen in their spiral arms. Elliptical galaxies are largely devoid of this gas, and so form few new stars. The supply of star-forming material is finite; once stars have converted the available supply of hydrogen into heavier elements, new star formation will come to an end. The current era of star formation is expected to continue for up to one hundred billion years, and then the "stellar age" will wind down after about ten trillion to one hundred trillion years (1013–1014 years), as the smallest, longest-lived stars in our universe, tiny red dwarfs, begin to fade. At the end of the stellar age, galaxies will be composed of compact objects: brown dwarfs, white dwarfs that are cooling or cold ("black dwarfs"), neutron stars, and black holes. Eventually, as a result of gravitational relaxation, all stars will either fall into central supermassive black holes or be flung into intergalactic space as a result of collisions. Deep sky surveys show that galaxies are often found in groups and clusters. Solitary galaxies that have not significantly interacted with another galaxy of comparable mass during the past billion years are relatively scarce. Only about 5% of the galaxies surveyed have been found to be truly isolated; however, these isolated formations may have interacted and even merged with other galaxies in the past, and may still be orbited by smaller, satellite galaxies. Isolated galaxies[note 2] can produce stars at a higher rate than normal, as their gas is not being stripped by other nearby galaxies. On the largest scale, the Universe is continually expanding, resulting in an average increase in the separation between individual galaxies (see Hubble's law). Associations of galaxies can overcome this expansion on a local scale through their mutual gravitational attraction. These associations formed early in the Universe, as clumps of dark matter pulled their respective galaxies together. Nearby groups later merged to form larger-scale clusters. This on-going merger process (as well as an influx of infalling gas) heats the inter-galactic gas within a cluster to very high temperatures, reaching 30–100 megakelvins. About 70–80% of the mass in a cluster is in the form of dark matter, with 10–30% consisting of this heated gas and the remaining few percent of the matter in the form of galaxies. Seyfert's Sextet is an example of a compact galaxy group. Most galaxies in the Universe are gravitationally bound to a number of other galaxies. These form a fractal-like hierarchical distribution of clustered structures, with the smallest such associations being termed groups. A group of galaxies is the most common type of galactic cluster, and these formations contain a majority of the galaxies (as well as most of the baryonic mass) in the Universe. To remain gravitationally bound to such a group, each member galaxy must have a sufficiently low velocity to prevent it from escaping (see Virial theorem). If there is insufficient kinetic energy, however, the group may evolve into a smaller number of galaxies through mergers. Clusters of galaxies consist of hundreds to thousands of galaxies bound together by gravity. 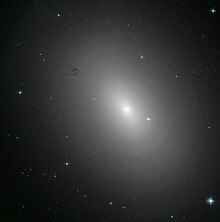 Clusters of galaxies are often dominated by a single giant elliptical galaxy, known as the brightest cluster galaxy, which, over time, tidally destroys its satellite galaxies and adds their mass to its own. Superclusters contain tens of thousands of galaxies, which are found in clusters, groups and sometimes individually. At the supercluster scale, galaxies are arranged into sheets and filaments surrounding vast empty voids. Above this scale, the Universe appears to be the same in all directions (isotropic and homogeneous). The Milky Way galaxy is a member of an association named the Local Group, a relatively small group of galaxies that has a diameter of approximately one megaparsec. The Milky Way and the Andromeda Galaxy are the two brightest galaxies within the group; many of the other member galaxies are dwarf companions of these two galaxies. The Local Group itself is a part of a cloud-like structure within the Virgo Supercluster, a large, extended structure of groups and clusters of galaxies centered on the Virgo Cluster. And the Virgo Supercluster itself is a part of the Pisces-Cetus Supercluster Complex, a giant galaxy filament. This ultraviolet image of Andromeda shows blue regions containing young, massive stars. The peak radiation of most stars lies in the visible spectrum, so the observation of the stars that form galaxies has been a major component of optical astronomy. It is also a favorable portion of the spectrum for observing ionized H II regions, and for examining the distribution of dusty arms. The dust present in the interstellar medium is opaque to visual light. It is more transparent to far-infrared, which can be used to observe the interior regions of giant molecular clouds and galactic cores in great detail. Infrared is also used to observe distant, red-shifted galaxies that were formed much earlier in the history of the Universe. Water vapor and carbon dioxide absorb a number of useful portions of the infrared spectrum, so high-altitude or space-based telescopes are used for infrared astronomy. The first non-visual study of galaxies, particularly active galaxies, was made using radio frequencies. The Earth's atmosphere is nearly transparent to radio between 5 MHz and 30 GHz. (The ionosphere blocks signals below this range.) Large radio interferometers have been used to map the active jets emitted from active nuclei. Radio telescopes can also be used to observe neutral hydrogen (via 21 cm radiation), including, potentially, the non-ionized matter in the early Universe that later collapsed to form galaxies. Ultraviolet and X-ray telescopes can observe highly energetic galactic phenomena. Ultraviolet flares are sometimes observed when a star in a distant galaxy is torn apart from the tidal forces of a nearby black hole. The distribution of hot gas in galactic clusters can be mapped by X-rays. The existence of supermassive black holes at the cores of galaxies was confirmed through X-ray astronomy. ^ Galaxies to the left side of the Hubble classification scheme are sometimes referred to as "early-type", while those to the right are "late-type". ^ The term "field galaxy" is sometimes used to mean an isolated galaxy, although the same term is also used to describe galaxies that do not belong to a cluster but may be a member of a group of galaxies. ^ Hupp, E.; Roy, S.; Watzke, M. (August 12, 2006). "NASA Finds Direct Proof of Dark Matter". NASA. Retrieved April 17, 2007. ^ Uson, J. M.; Boughn, S. P.; Kuhn, J. R. (1990). "The central galaxy in Abell 2029 – An old supergiant". Science. 250 (4980): 539–540. Bibcode:1990Sci...250..539U. doi:10.1126/science.250.4980.539. PMID 17751483. Graham, A. W.; Guzman, R. (2003). "HST Photometry of Dwarf Elliptical Galaxies in Coma, and an Explanation for the Alleged Structural Dichotomy between Dwarf and Bright Elliptical Galaxies". The Astronomical Journal. 125 (6): 2936–2950. arXiv:astro-ph/0303391. Bibcode:2003AJ....125.2936G. doi:10.1086/374992. ^ a b Jarrett, T. H. "Near-Infrared Galaxy Morphology Atlas". California Institute of Technology. Retrieved January 9, 2007. ^ Finley, D.; Aguilar, D. (November 2, 2005). "Astronomers Get Closest Look Yet At Milky Way's Mysterious Core". National Radio Astronomy Observatory. Retrieved August 10, 2006. ^ Gott III, J. R.; et al. (2005). "A Map of the Universe". The Astrophysical Journal. 624 (2): 463–484. arXiv:astro-ph/0310571. Bibcode:2005ApJ...624..463G. doi:10.1086/428890. ^ a b Christopher J. Conselice; et al. (2016). "The Evolution of Galaxy Number Density at z < 8 and its Implications". The Astrophysical Journal. 830 (2): 83. arXiv:1607.03909v2. Bibcode:2016ApJ...830...83C. doi:10.3847/0004-637X/830/2/83. ^ a b Fountain, Henry (October 17, 2016). "Two Trillion Galaxies, at the Very Least". The New York Times. Retrieved October 17, 2016. ^ Mackie, Glen (February 1, 2002). "To see the Universe in a Grain of Taranaki Sand". Centre for Astrophysics and Supercomputing. Retrieved January 28, 2017. ^ "Galaxy Clusters and Large-Scale Structure". University of Cambridge. Retrieved January 15, 2007. ^ Gibney, Elizabeth (2014). "Earth's new address: 'Solar System, Milky Way, Laniakea'". Nature. doi:10.1038/nature.2014.15819. ^ a b Harper, D. "galaxy". Online Etymology Dictionary. Retrieved November 11, 2011. ^ Konečný, Lubomír. "Emblematics, Agriculture, and Mythography in The Origin of the Milky Way" (PDF). Academy of Sciences of the Czech Republic. Archived from the original (PDF) on July 20, 2006. Retrieved January 5, 2007. ^ Rao, J. (September 2, 2005). "Explore the Archer's Realm". Space.com. Retrieved January 3, 2007. ^ Plutarch (2006). The Complete Works Volume 3: Essays and Miscellanies. Chapter 3: Echo Library. p. 66. ISBN 978-1-4068-3224-2. ^ a b c Montada, J. P. (September 28, 2007). "Ibn Bâjja". Stanford Encyclopedia of Philosophy. Retrieved July 11, 2008. ^ Bouali, H.-E.; Zghal, M.; Lakhdar, Z. B. (2005). "Popularisation of Optical Phenomena: Establishing the First Ibn Al-Haytham Workshop on Photography" (PDF). The Education and Training in Optics and Photonics Conference. Retrieved July 8, 2008. ^ O'Connor, John J.; Robertson, Edmund F., "Abu Arrayhan Muhammad ibn Ahmad al-Biruni", MacTutor History of Mathematics archive, University of St Andrews . ^ Livingston, J. W. (1971). "Ibn Qayyim al-Jawziyyah: A Fourteenth Century Defense against Astrological Divination and Alchemical Transmutation". Journal of the American Oriental Society. 91 (1): 96–103 . doi:10.2307/600445. JSTOR 600445. ^ Galileo Galilei, Sidereus Nuncius (Venice, (Italy): Thomas Baglioni, 1610), pages 15 and 16. English translation: Galileo Galilei with Edward Stafford Carlos, trans., The Sidereal Messenger (London, England: Rivingtons, 1880), pages 42 and 43. ^ O'Connor, J. J.; Robertson, E. F. (November 2002). "Galileo Galilei". University of St. Andrews. Retrieved January 8, 2007. ^ Thomas Wright, An Original Theory or New Hypothesis of the Universe … (London, England: H. Chapelle, 1750). From p.48: " … the stars are not infinitely dispersed and distributed in a promiscuous manner throughout all the mundane space, without order or design, … this phænomenon [is] no other than a certain effect arising from the observer's situation, … To a spectator placed in an indefinite space, … it [i.e., the Milky Way (Via Lactea)] [is] a vast ring of stars … "
On page 73, Wright called the Milky Way the Vortex Magnus (the great whirlpool) and estimated its diameter at 8.64×1012 miles (13.9×1012 km). ^ a b c d Evans, J. C. (November 24, 1998). "Our Galaxy". George Mason University. Archived from the original on June 30, 2012. Retrieved January 4, 2007. ^ Immanuel Kant, Allgemeine Naturgeschichte und Theorie des Himmels … [Universal Natural History and Theory of the Heavens … ], (Königsberg and Leipzig, (Germany): Johann Friederich Petersen, 1755). ^ William Herschel (1785). "XII. On the construction of the heavens". Giving Some Accounts of the Present Undertakings, Studies, and Labours, of the Ingenious, in Many Considerable Parts of the World. Philosophical Transactions of the Royal Society of London. vol. 75. London. pp. 213–266. doi:10.1098/rstl.1785.0012. ISSN 0261-0523. Herschel's diagram of the galaxy appears immediately after the article's last page. ^ Trimble, V. (1999). "Robert Trumpler and the (Non)transparency of Space". Bulletin of the American Astronomical Society. 31 (31): 1479. Bibcode:1999AAS...195.7409T. ^ a b "The Large Magellanic Cloud, LMC". Observatoire de Paris. March 11, 2004. Archived from the original on June 22, 2017. ^ "Abd-al-Rahman Al Sufi (December 7, 903 – May 25, 986 A.D.)". Observatoire de Paris. Retrieved April 19, 2007. ^ Gordon, Kurtiss J. "History of our Understanding of a Spiral Galaxy: Messier 33". Caltech.edu. Retrieved June 11, 2018. ^ See text quoted from Wright's An original theory or new hypothesis of the Universe in Dyson, F. (1979). Disturbing the Universe. Pan Books. p. 245. ISBN 978-0-330-26324-5. ^ "Parsonstown | The genius of the Parsons family | William Rosse". parsonstown.info. ^ Slipher, V. M. (1913). "The radial velocity of the Andromeda Nebula". Lowell Observatory Bulletin. 1: 56–57. Bibcode:1913LowOB...2...56S. ^ Slipher, V. M. (1915). "Spectrographic Observations of Nebulae". Popular Astronomy. Vol. 23. pp. 21–24. Bibcode:1915PA.....23...21S. ^ Curtis, H. D. (1988). "Novae in Spiral Nebulae and the Island Universe Theory". Publications of the Astronomical Society of the Pacific. 100: 6. Bibcode:1988PASP..100....6C. doi:10.1086/132128. ^ Weaver, H. F. "Robert Julius Trumpler". US National Academy of Sciences. Retrieved January 5, 2007. ^ Öpik, E. (1922). "An estimate of the distance of the Andromeda Nebula". The Astrophysical Journal. 55: 406. Bibcode:1922ApJ....55..406O. doi:10.1086/142680. ^ Hubble, E. P. (1929). "A spiral nebula as a stellar system, Messier 31". The Astrophysical Journal. 69: 103–158. Bibcode:1929ApJ....69..103H. doi:10.1086/143167. ^ Sandage, A. (1989). "Edwin Hubble, 1889–1953". Journal of the Royal Astronomical Society of Canada. 83 (6): 351–362. Bibcode:1989JRASC..83..351S. Retrieved January 8, 2007. ^ Tenn, J. "Hendrik Christoffel van de Hulst". Sonoma State University. Retrieved January 5, 2007. ^ López-Corredoira, M.; et al. (2001). "Searching for the in-plane Galactic bar and ring in DENIS". Astronomy and Astrophysics. 373 (1): 139–152. arXiv:astro-ph/0104307. Bibcode:2001A&A...373..139L. doi:10.1051/0004-6361:20010560. ^ Rubin, V. C. (1983). "Dark matter in spiral galaxies". Scientific American. Vol. 248 no. 6. pp. 96–106. Bibcode:1983SciAm.248f..96R. doi:10.1038/scientificamerican0683-96. ^ Rubin, V. C. (2000). "One Hundred Years of Rotating Galaxies". Publications of the Astronomical Society of the Pacific. 112 (772): 747–750. Bibcode:2000PASP..112..747R. doi:10.1086/316573. ^ "Observable Universe contains ten times more galaxies than previously thought". www.spacetelescope.org. Retrieved October 17, 2016. ^ "Hubble Rules Out a Leading Explanation for Dark Matter". Hubble News Desk. October 17, 1994. Retrieved January 8, 2007. ^ "How many galaxies are there?". NASA. November 27, 2002. Retrieved January 8, 2007. ^ Kraan-Korteweg, R. C.; Juraszek, S. (2000). "Mapping the hidden Universe: The galaxy distribution in the Zone of Avoidance". Publications of the Astronomical Society of Australia. 17 (1): 6–12. arXiv:astro-ph/9910572. Bibcode:2000PASA...17....6K. doi:10.1071/AS00006. ^ "Universe has two trillion galaxies, astronomers say". The Guardian. October 13, 2016. Retrieved October 14, 2016. ^ "The Universe Has 10 Times More Galaxies Than Scientists Thought". space.com. October 13, 2016. Retrieved October 14, 2016. ^ Barstow, M. A. (2005). 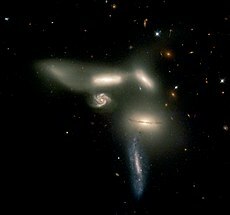 "Elliptical Galaxies". Leicester University Physics Department. Archived from the original on July 29, 2012. Retrieved June 8, 2006. ^ "Galaxies". Cornell University. October 20, 2005. Archived from the original on June 29, 2014. Retrieved August 10, 2006. ^ "Galactic onion". www.spacetelescope.org. Retrieved May 11, 2015. ^ Williams, M. J.; Bureau, M.; Cappellari, M. (2010). "Kinematic constraints on the stellar and dark matter content of spiral and S0 galaxies". Monthly Notices of the Royal Astronomical Society. 400 (4): 1665–1689. arXiv:0909.0680. Bibcode:2009MNRAS.400.1665W. doi:10.1111/j.1365-2966.2009.15582.x. ^ Smith, G. (March 6, 2000). "Galaxies — The Spiral Nebulae". University of California, San Diego Center for Astrophysics & Space Sciences. Archived from the original on July 10, 2012. Retrieved November 30, 2006. ^ Eskridge, P. B.; Frogel, J. A. (1999). "What is the True Fraction of Barred Spiral Galaxies?". Astrophysics and Space Science. 269/270: 427–430. Bibcode:1999Ap&SS.269..427E. doi:10.1023/A:1017025820201. ^ Bournaud, F.; Combes, F. (2002). "Gas accretion on spiral galaxies: Bar formation and renewal". Astronomy and Astrophysics. 392 (1): 83–102. arXiv:astro-ph/0206273. Bibcode:2002A&A...392...83B. doi:10.1051/0004-6361:20020920. ^ Knapen, J. H.; Perez-Ramirez, D.; Laine, S. (2002). "Circumnuclear regions in barred spiral galaxies — II. Relations to host galaxies". Monthly Notices of the Royal Astronomical Society. 337 (3): 808–828. arXiv:astro-ph/0207258. Bibcode:2002MNRAS.337..808K. doi:10.1046/j.1365-8711.2002.05840.x. ^ Alard, C. (2001). "Another bar in the Bulge". Astronomy and Astrophysics Letters. 379 (2): L44–L47. arXiv:astro-ph/0110491. Bibcode:2001A&A...379L..44A. doi:10.1051/0004-6361:20011487. ^ Sanders, R. (January 9, 2006). "Milky Way galaxy is warped and vibrating like a drum". UCBerkeley News. Retrieved May 24, 2006. ^ Bell, G. R.; Levine, S. E. (1997). "Mass of the Milky Way and Dwarf Spheroidal Stream Membership". Bulletin of the American Astronomical Society. 29 (2): 1384. Bibcode:1997AAS...19110806B. ^ "We Just Discovered a New Type of Colossal Galaxy". Futurism. March 21, 2016. Retrieved March 21, 2016. ^ Ogle, Patrick M.; Lanz, Lauranne; Nader, Cyril; Helou, George (January 1, 2016). "Superluminous Spiral Galaxies". The Astrophysical Journal. 817 (2): 109. arXiv:1511.00659. Bibcode:2016ApJ...817..109O. doi:10.3847/0004-637X/817/2/109. ISSN 0004-637X. ^ Gerber, R. A.; Lamb, S. A.; Balsara, D. S. (1994). "Ring Galaxy Evolution as a Function of "Intruder" Mass". Bulletin of the American Astronomical Society. 26: 911. Bibcode:1994AAS...184.3204G. ^ "ISO unveils the hidden rings of Andromeda" (Press release). European Space Agency. October 14, 1998. Archived from the original on August 28, 1999. Retrieved May 24, 2006. ^ "Spitzer Reveals What Edwin Hubble Missed". Harvard-Smithsonian Center for Astrophysics. May 31, 2004. Archived from the original on September 7, 2006. Retrieved December 6, 2006. ^ Barstow, M. A. (2005). "Irregular Galaxies". University of Leicester. Archived from the original on February 27, 2012. Retrieved December 5, 2006. ^ Phillipps, S.; Drinkwater, M. J.; Gregg, M. D.; Jones, J. B. (2001). "Ultracompact Dwarf Galaxies in the Fornax Cluster". The Astrophysical Journal. 560 (1): 201–206. arXiv:astro-ph/0106377. Bibcode:2001ApJ...560..201P. doi:10.1086/322517. ^ Groshong, K. (April 24, 2006). "Strange satellite galaxies revealed around Milky Way". New Scientist. Retrieved January 10, 2007. ^ Schirber, M. (August 27, 2008). "No Slimming Down for Dwarf Galaxies". ScienceNOW. Retrieved August 27, 2008. ^ a b c "Galaxy Interactions". University of Maryland Department of Astronomy. Archived from the original on May 9, 2006. Retrieved December 19, 2006. ^ a b c "Interacting Galaxies". Swinburne University. Retrieved December 19, 2006. ^ "Happy Sweet Sixteen, Hubble Telescope!". NASA. April 24, 2006. Retrieved August 10, 2006. ^ a b "Starburst Galaxies". Harvard-Smithsonian Center for Astrophysics. August 29, 2006. Retrieved August 10, 2006. ^ Kennicutt Jr., R. C.; et al. (2005). Demographics and Host Galaxies of Starbursts. Starbursts: From 30 Doradus to Lyman Break Galaxies. Springer. p. 187. Bibcode:2005ASSL..329..187K. doi:10.1007/1-4020-3539-X_33. ^ Smith, G. (July 13, 2006). "Starbursts & Colliding Galaxies". University of California, San Diego Center for Astrophysics & Space Sciences. Archived from the original on July 7, 2012. Retrieved August 10, 2006. ^ Keel, B. (September 2006). "Starburst Galaxies". University of Alabama. Retrieved December 11, 2006. ^ a b Keel, W. C. (2000). "Introducing Active Galactic Nuclei". University of Alabama. Retrieved December 6, 2006. ^ a b Lochner, J.; Gibb, M. "A Monster in the Middle". NASA. Retrieved December 20, 2006. ^ a b Heckman, T. M. (1980). "An optical and radio survey of the nuclei of bright galaxies — Activity in normal galactic nuclei". Astronomy and Astrophysics. 87: 152–164. Bibcode:1980A&A....87..152H. ^ Ho, L. C.; Filippenko, A. V.; Sargent, W. L. W. (1997). "A Search for "Dwarf" Seyfert Nuclei. V. Demographics of Nuclear Activity in Nearby Galaxies". The Astrophysical Journal. 487 (2): 568–578. arXiv:astro-ph/9704108. Bibcode:1997ApJ...487..568H. doi:10.1086/304638. ^ a b Beck, Rainer (2007). "Galactic magnetic fields". Scholarpedia. 2. p. 2411. Bibcode:2007SchpJ...2.2411B. doi:10.4249/scholarpedia.2411. Retrieved November 5, 2015. ^ "Construction Secrets of a Galactic Metropolis". www.eso.org. ESO Press Release. Retrieved October 15, 2014. ^ a b "Protogalaxies". Harvard-Smithsonian Center for Astrophysics. November 18, 1999. Archived from the original on March 25, 2008. Retrieved January 10, 2007. ^ Firmani, C.; Avila-Reese, V. (2003). "Physical processes behind the morphological Hubble sequence". Revista Mexicana de Astronomía y Astrofísica. 17: 107–120. arXiv:astro-ph/0303543. Bibcode:2003RMxAC..17..107F. ^ McMahon, R. (2006). "Astronomy: Dawn after the dark age". Nature. 443 (7108): 151–2. Bibcode:2006Natur.443..151M. doi:10.1038/443151a. PMID 16971933. ^ Wall, Mike (December 12, 2012). "Ancient Galaxy May Be Most Distant Ever Seen". Space.com. Retrieved December 12, 2012. ^ "Cosmic Detectives". The European Space Agency (ESA). April 2, 2013. Retrieved April 15, 2013. ^ "HubbleSite – NewsCenter – Astronomers Set a New Galaxy Distance Record (05/05/2015) – Introduction". hubblesite.org. Retrieved May 7, 2015. ^ "This Galaxy Far, Far Away Is the Farthest One Yet Found". Retrieved May 7, 2015. ^ a b "Astronomers unveil the farthest galaxy". Retrieved May 7, 2015. ^ Overbye, Dennis (May 5, 2015). "Astronomers Measure Distance to Farthest Galaxy Yet". The New York Times. ISSN 0362-4331. Retrieved May 7, 2015. ^ Oesch, P. A.; van Dokkum, P. G.; Illingworth, G. D.; Bouwens, R. J.; Momcheva, I.; Holden, B.; Roberts-Borsani, G. W.; Smit, R.; Franx, M. (February 18, 2015). "A Spectroscopic Redshift Measurement for a Luminous Lyman Break Galaxy at z=7.730 using Keck/MOSFIRE". The Astrophysical Journal. 804 (2): L30. arXiv:1502.05399. Bibcode:2015ApJ...804L..30O. doi:10.1088/2041-8205/804/2/L30. ^ "Signatures of the Earliest Galaxies". Retrieved September 15, 2015. ^ Eggen, O. J.; Lynden-Bell, D.; Sandage, A. R. (1962). "Evidence from the motions of old stars that the Galaxy collapsed". The Astrophysical Journal. 136: 748. Bibcode:1962ApJ...136..748E. doi:10.1086/147433. ^ Searle, L.; Zinn, R. (1978). "Compositions of halo clusters and the formation of the galactic halo". The Astrophysical Journal. 225 (1): 357–379. Bibcode:1978ApJ...225..357S. doi:10.1086/156499. ^ Heger, A.; Woosley, S. E. (2002). "The Nucleosynthetic Signature of Population III". The Astrophysical Journal. 567 (1): 532–543. arXiv:astro-ph/0107037. Bibcode:2002ApJ...567..532H. doi:10.1086/338487. ^ Barkana, R.; Loeb, A. (2001). "In the beginning: the first sources of light and the reionization of the Universe" (PDF). Physics Reports (Submitted manuscript). 349 (2): 125–238. arXiv:astro-ph/0010468. Bibcode:2001PhR...349..125B. doi:10.1016/S0370-1573(01)00019-9. ^ Sobral, David; Matthee, Jorryt; Darvish, Behnam; Schaerer, Daniel; Mobasher, Bahram; Röttgering, Huub J. A.; Santos, Sérgio; Hemmati, Shoubaneh (June 4, 2015). "Evidence for POPIII-like Stellar Populations in the Most Luminous LYMAN-α Emitters at the Epoch of Re-ionisation: Spectroscopic Confirmation". The Astrophysical Journal. 808 (2): 139. arXiv:1504.01734. Bibcode:2015ApJ...808..139S. doi:10.1088/0004-637x/808/2/139. ^ Overbye, Dennis (June 17, 2015). "Traces of Earliest Stars That Enriched Cosmos Are Spied". The New York Times. Retrieved June 17, 2015. ^ "Simulations Show How Growing Black Holes Regulate Galaxy Formation". Carnegie Mellon University. February 9, 2005. Archived from the original on June 4, 2012. Retrieved January 7, 2007. ^ Massey, R. (April 21, 2007). "Caught in the act; forming galaxies captured in the young Universe". Royal Astronomical Society. Archived from the original on November 15, 2013. Retrieved April 20, 2007. ^ Noguchi, M. (1999). "Early Evolution of Disk Galaxies: Formation of Bulges in Clumpy Young Galactic Disks". The Astrophysical Journal. 514 (1): 77–95. arXiv:astro-ph/9806355. Bibcode:1999ApJ...514...77N. doi:10.1086/306932. ^ Baugh, C.; Frenk, C. (May 1999). "How are galaxies made?". PhysicsWeb. Archived from the original on April 26, 2007. Retrieved January 16, 2007. ^ Gonzalez, G. (1998). The Stellar Metallicity — Planet Connection. Brown dwarfs and extrasolar planets: Proceedings of a workshop ... p. 431. Bibcode:1998ASPC..134..431G. ^ Moskowitz, Clara (September 25, 2012). "Hubble Telescope Reveals Farthest View Into Universe Ever". Space.com. Retrieved September 26, 2012. ^ Conselice, C. J. (February 2007). "The Universe's Invisible Hand". Scientific American. Vol. 296 no. 2. pp. 35–41. Bibcode:2007SciAm.296b..34C. doi:10.1038/scientificamerican0207-34. ^ Ford, H.; et al. (April 30, 2002). "The Mice (NGC 4676): Colliding Galaxies With Tails of Stars and Gas". Hubble News Desk. Retrieved May 8, 2007. ^ Struck, C. (1999). "Galaxy Collisions". Physics Reports. 321 (1–3): 1–137. arXiv:astro-ph/9908269. Bibcode:1999PhR...321....1S. doi:10.1016/S0370-1573(99)00030-7. ^ Wong, J. (April 14, 2000). "Astrophysicist maps out our own galaxy's end". University of Toronto. Archived from the original on January 8, 2007. Retrieved January 11, 2007. ^ Panter, B.; Jimenez, R.; Heavens, A. F.; Charlot, S. (2007). "The star formation histories of galaxies in the Sloan Digital Sky Survey". Monthly Notices of the Royal Astronomical Society. 378 (4): 1550–1564. arXiv:astro-ph/0608531. Bibcode:2007MNRAS.378.1550P. doi:10.1111/j.1365-2966.2007.11909.x. ^ Kennicutt Jr., R. C.; Tamblyn, P.; Congdon, C. E. (1994). "Past and future star formation in disk galaxies". The Astrophysical Journal. 435 (1): 22–36. Bibcode:1994ApJ...435...22K. doi:10.1086/174790. ^ Knapp, G. R. (1999). Star Formation in Early Type Galaxies. Star Formation in Early Type Galaxies. 163. Astronomical Society of the Pacific. p. 119. arXiv:astro-ph/9808266. Bibcode:1999ASPC..163..119K. ISBN 978-1-886733-84-8. OCLC 41302839. ^ a b Adams, Fred; Laughlin, Greg (July 13, 2006). "The Great Cosmic Battle". Astronomical Society of the Pacific. Retrieved January 16, 2007. ^ "Cosmic 'Murder Mystery' Solved: Galaxies Are 'Strangled to Death'". Retrieved May 14, 2015. ^ Pobojewski, S. (January 21, 1997). "Physics offers glimpse into the dark side of the Universe". University of Michigan. Retrieved January 13, 2007. ^ McKee, M. (June 7, 2005). "Galactic loners produce more stars". New Scientist. Retrieved January 15, 2007. ^ "Groups & Clusters of Galaxies". NASA/Chandra. Retrieved January 15, 2007. ^ Ricker, P. "When Galaxy Clusters Collide". San Diego Supercomputer Center. Retrieved August 27, 2008. ^ Dahlem, M. (November 24, 2006). "Optical and radio survey of Southern Compact Groups of galaxies". University of Birmingham Astrophysics and Space Research Group. Archived from the original on June 13, 2007. Retrieved January 15, 2007. ^ Ponman, T. (February 25, 2005). "Galaxy Systems: Groups". University of Birmingham Astrophysics and Space Research Group. Archived from the original on February 15, 2009. Retrieved January 15, 2007. ^ Girardi, M.; Giuricin, G. (2000). "The Observational Mass Function of Loose Galaxy Groups". The Astrophysical Journal. 540 (1): 45–56. arXiv:astro-ph/0004149. Bibcode:2000ApJ...540...45G. doi:10.1086/309314. ^ "Hubble Pinpoints Furthest Protocluster of Galaxies Ever Seen". ESA/Hubble Press Release. Retrieved January 22, 2015. ^ Dubinski, J. (1998). "The Origin of the Brightest Cluster Galaxies". The Astrophysical Journal. 502 (2): 141–149. arXiv:astro-ph/9709102. Bibcode:1998ApJ...502..141D. doi:10.1086/305901. Archived from the original on May 14, 2011. Retrieved January 16, 2007. ^ Bahcall, N. A. (1988). "Large-scale structure in the Universe indicated by galaxy clusters". Annual Review of Astronomy and Astrophysics. 26 (1): 631–686. Bibcode:1988ARA&A..26..631B. doi:10.1146/annurev.aa.26.090188.003215. ^ Mandolesi, N.; et al. (1986). "Large-scale homogeneity of the Universe measured by the microwave background". Letters to Nature. 319 (6056): 751–753. Bibcode:1986Natur.319..751M. doi:10.1038/319751a0. ^ van den Bergh, S. (2000). "Updated Information on the Local Group". Publications of the Astronomical Society of the Pacific. 112 (770): 529–536. arXiv:astro-ph/0001040. Bibcode:2000PASP..112..529V. doi:10.1086/316548. ^ Tully, R. B. (1982). "The Local Supercluster". The Astrophysical Journal. 257: 389–422. Bibcode:1982ApJ...257..389T. doi:10.1086/159999. ^ "Near, Mid & Far Infrared". IPAC/NASA. Archived from the original on December 30, 2006. Retrieved January 2, 2007. ^ "ATLASGAL Survey of Milky Way Completed". Retrieved March 7, 2016. ^ "The Effects of Earth's Upper Atmosphere on Radio Signals". NASA. Retrieved August 10, 2006. ^ "Giant Radio Telescope Imaging Could Make Dark Matter Visible". ScienceDaily. December 14, 2006. Retrieved January 2, 2007. ^ "NASA Telescope Sees Black Hole Munch on a Star". NASA. December 5, 2006. Retrieved January 2, 2007. ^ Dunn, R. "An Introduction to X-ray Astronomy". Institute of Astronomy X-Ray Group. Retrieved January 2, 2007. "Unveiling the Secret of a Virgo Dwarf Galaxy". ESO. May 3, 2000. Archived from the original on January 9, 2009. Retrieved January 3, 2007. Al-Biruni (2004). The Book of Instruction in the Elements of the Art of Astrology. R. Ramsay Wright (transl.). Kessinger Publishing. ISBN 978-0-7661-9307-9. Belkora, L. (2003). Minding the Heavens: the Story of our Discovery of the Milky Way. CRC Press. ISBN 978-0-7503-0730-7. Bertin, G.; Lin, C.-C. (1996). Spiral Structure in Galaxies: a Density Wave Theory. MIT Press. ISBN 978-0-262-02396-2. Binney, J.; Merrifield, M. (1998). Galactic Astronomy. Princeton University Press. ISBN 978-0-691-00402-0. OCLC 39108765. Dickinson, T. (2004). The Universe and Beyond (4th ed.). Firefly Books. ISBN 978-1-55297-901-3. OCLC 55596414. Heidarzadeh, T. (2008). A History of Physical Theories of Comets, from Aristotle to Whipple. Springer. ISBN 978-1-4020-8322-8. Mo, Houjun; van den Bosch, Frank; White, Simon (2010). Galaxy Formation and Evolution (1 ed.). Cambridge University Press. ISBN 978-0-521-85793-2. Kepple, G. R.; Sanner, G. W. (1998). The Night Sky Observer's Guide, Volume 1. Willmann-Bell. ISBN 978-0-943396-58-3. Merritt, D. (2013). Dynamics and Evolution of Galactic Nuclei. Princeton University Press. ISBN 978-1-4008-4612-2. Mohamed, M. (2000). Great Muslim Mathematicians. Penerbit UTM. ISBN 978-983-52-0157-8. OCLC 48759017. Paul, E. R. (1993). The Milky Way Galaxy and Statistical Cosmology, 1890–1924. Cambridge University Press. ISBN 978-0-521-35363-2. Sparke, L. S.; Gallagher III, J. S. (2000). Galaxies in the Universe: An Introduction. Cambridge University Press. ISBN 978-0-521-59740-1. Van den Bergh, S. (1998). Galaxy Morphology and Classification. Cambridge University Press. ISBN 978-0-521-62335-3. Waller, W. H.; Hodge, P. W. (2003). Galaxies and the Cosmic Frontier. Harvard University Press. ISBN 978-0-674-01079-6. How many galaxies are in our Universe? 3-D Video (01:46) – Over a Million Galaxies of Billions of Stars each – BerkeleyLab/animated.